FREMONT, Calif., Sept. 25, 2018 /PRNewswire/ -- NEXTracker™, a Flex company, today announced that it has successfully trained five hundred graduates from its global tracker installation program, PowerworX™ Academy. The program was launched in 2015 to help meet the workforce development needs of utility-scale solar growth markets worldwide and to help ensure plant lifetime performance and profitability. Five hundred solar installers from Australia, Brazil, Egypt, India, Mexico, and the United States have received in-depth, hands-on training in key design principles and installation best practices for NEXTracker's industry-leading smart solar tracker, NX Horizon™. Participants have included ACWA Power, Biosar, Clenera, Enilso, First Solar, and RCR among many other top-tier global engineering procurement contracting (EPC) companies. Given the popularity of this course, NEXTracker has expanded this course to include commissioning and operation and maintenance (O&M) for its solar tracker, TrueCapture™ software control system, and energy storage product lines. "PowerworX is our proactive response to a huge labor shortage given the amount of solar scheduled to be installed in the coming years," said Martin Rogers, Vice President of Global Services and Asset Management at NEXTracker. "Providing our customers and partners superior support, products and installation expertise is woven into the fabric of our Global Services program. By continuing to develop the curriculum for commissioning, software support and O&M training, we can now help solar workers develop skills applicable across a power plant's lifecycle, from construction through its 30-year operational life." Due to the steady decline of PPA pricing and balance of system costs among other factors, the continued growth of the solar market is demanding a more skilled workforce. As the energy economy transforms into the renewable economy, information on skills, training and education is crucial in helping decision makers design policies to support renewable energy labor markets. "The PowerworX installer training program gave us hands-on experience installing NEXTracker's products in a controlled environment with knowledgeable teachers guiding us every step of the way," stated Ashish Ghosh, site leader for Sterling and Wilson, a global EPC based in India who participated in PowerworX this past spring. "I thought it would be complicated but it's an easy system to install. NEXTracker's instructors have a deep understanding of their product and O&M – this program was very practical for future projects." High growth solar market regions like Brazil, China, Germany, India, Japan, and the U. S. accounted for most of the renewable energy jobs highlighted in the IRENA report. NEXTracker's PowerworX Academy consists of three-day sessions focusing on tracker installation, commissioning and O&M hands-on and in-classroom training. 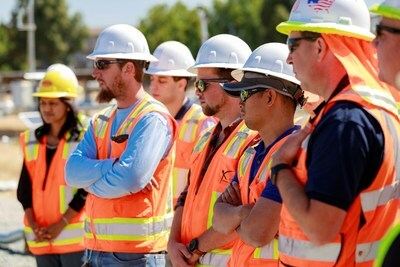 Any graduate of the program will receive 20 professional development credits from the North American Board of Certified Energy Practitioners (NABCEP), the leading electrical certification board in the U.S. NEXTracker is also adding its energy storage solutions, known as NX Flow and NX Drive, to its curriculum, reflecting NEXTracker's latest product lines in energy storage systems. To attend the PowerworX Academy, register for an upcoming session here. To see a PowerworX session live, watch this video. NEXTracker, a Flex company, advances the power plant of the future with smart solar tracker, energy storage, and software control applications that yield additional energy, optimize performance and reduce costs for project and plant owners. As the number-one tracker supplier worldwide with over 14 GW delivered or under fulfillment, NEXTracker is globally recognized for delivering smart and connected energy solutions for hundreds of projects across five continents. Headquartered in the San Francisco Bay Area, the company has offices in Australia, India, Latin America, and Europe. For more information, visit: NEXTracker.com and follow the company on Twitter @NEXTracker.